I would like to thank Keith Prothero for the gift of this bottle – thank you, Mr P, that was very kind of you. The whole idea of mono-varietal or oligo-varietal wines is that the varietal(s) selected are suitable for growing in and sympathetic in expressing the qualities of the terroir where they are planted. So, what the hell are the Badenhorst family doing? The French arch-master of field-blends of totally incompatible grape varietals is Jean-Michel Deiss. The white blends he fritters away serious vineyard-space making are as emetic as the man himself. Generally, wines are made from one to not more than a few accordant varietals. Some whites in the South of France are made from a greater number of discordant varietals, Chateauneuf du Pape Blanc* is a good example. With few exceptions, the stream from the bottle as you pour and inhale a first sniff of these wines suddenly make you think they are of jumentous origin. Avoid. Now, I am a clinically insane person of nonpareil lunacy-rank who has made wine, but there is simply no way I would even hallucinate making a wine made from a blend of these varietals. Consequently, I must investigate the Badenhorst credendum, whilst utilising all the skills I have assimilated from countless interactions with those of the psychiatric profession. 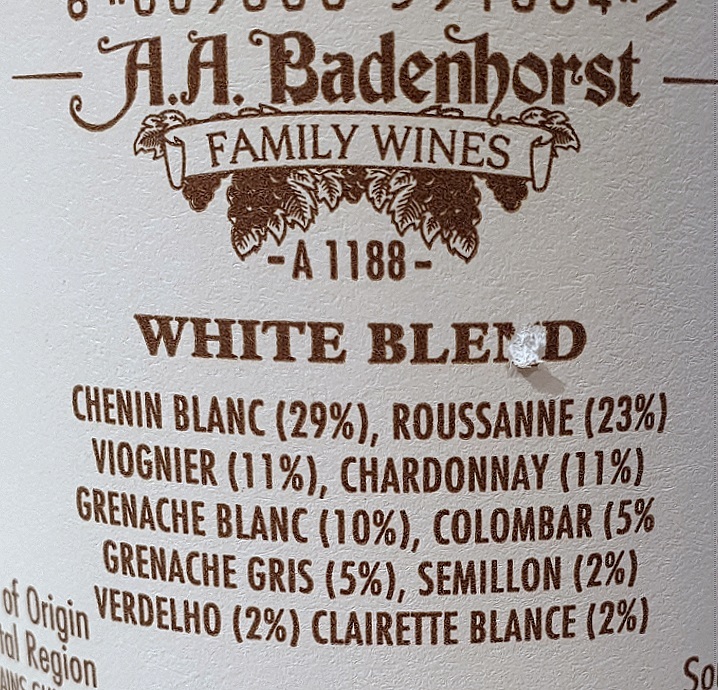 Right, it seems that Badenhorst clan wish to express the quality of the vineyards the grapes are grown in without there being a dominance of any varietal. This is what the nauseant Deiss claims he is aiming to do. Oh dear, this is not a good start. Furthermore, Badenhorst claim that they wish to emulate the ‘old wines of South Africa’, that were made from whatever vines happened to have been planted in an area a winemaker had access to. Psychologically questionable, but I can see a point here. So I pop and prepare to drink this wine with some trepidation. Let us go! It displays the same lemon-ish, apple-esque fruit that Chenin Blanc grown in the great, but ideally avoided, Loire region of Savennieres. However, it does not have all the wet wool, rotting wood and generally decayed aromas that every single wine from that region is suffused with. It is also bleeding boozy (14.5% claimed) as Savennieres seems to be legally obliged to be. Allied to this is an enormous sense of scale to the nose. It is huge, a massive, powerful wine of epic personality. Consequently, a first sniff makes one think it smells like a wonderful dream of a wine that I do not think exists in the real world, a clean Savennieres! I rather like Savennieres, but could do without all the foetid, mouldy and muddy aromas the vignerons appear to cherish. So I am distinctly surprised to say the nose of this appeals to me a great deal and it is rather, good god, classy and attractive. I can smell that this is going to be pretty acidic and indeed it has a real thrill of brisk acidity that keeps the huge palate frisky and full of life. It prickles your palate, masking most of the alcoholic burn and accentuating the odd pear-ish fruit and lovely stoniness that occupy your mouth and nasal cavities. Other flavours flash across your senses. For a moment I had a taste of very fresh mint leaf – quite delicious that was too – but this swiftly evolved into an aroma of some scented tea. Orange pekoe, I would say. As I slurped and chewed it I felt the texture suddenly showing hints of waxiness. Is there something slightly oxidative here? I will have another sniff. Well worth continual sniffing, I think, as right before my olfactory receptors this is changing, growing evolving into something very much like a white Hermitage. There is a hint of the oxidative character, but glue/solvent is definitely present now when I could detect no such things to start with. Again, it is squeaky clean. This wine is quite a wonder. The palate has definitely not sunk to the broad- and flabby-level that white Hermitage often shows, that acidity in this wine is never going to shy away from giving your tonsils a tickling. There are definitely oxidative baked apple flavours here, but it is not faulty or knackered, it has evolved into another level of expression. Extraordinary! I am rather enjoying this! It is still huge and mouth-filling in terms of scale, but rather than the odd fruits of Chenin, the candied fruits and butterscotch flavours one expects to find in a mature Marsanne/Roussanne blend tease an impressed little smile onto my face. I love wines that evolve in the glass; I love white Hermitage too, this is really impressive, without a doubt. There is another character that (oddly) seemed to emerge as the wine had air contact. It had clearly been subject to a reasonable degree of skin contact, as there is a distinct astringency to it. I did not notice this with my first mouthful, but now, in its super-clean, super-prestige cuvee Hermitage Blanc incarnation, it is verging on tannic! This astringency is coupled with a savoury character permeating the palate that I really like when I detect it in wines. So I am back sniffing it again and it is changing again! The oxidative character is growing a bit – indeed it is making me think I should drink up – but the glue and solvent tones of Hermitage are being replaced by the floral and stone fruits of Roussanne, Grenache Blanc and all those other pointless grape varietals they grow further down the Rhone. You may not believe me, but this wine has evolved from initially being a fabulous dream of a Savennieres to a brilliantly clean and really lovely Hermitage Blanc. As I am finishing up my final glass it has evolved once more into that most improbable of things: a really desirable, delicious and totally clean Chateauneuf du Pape Blanc! OK, it seems the slightest hint over-mature, but there are lovely, clean, fresh white fruit aromas, a really winning stone character and breadth, power and good acidity on the palate. As I said in a different review, big trade tastings where you only get thirty seconds with a wine are completely pointless when it comes to tasting wines like this. It has changed so much in the twenty minutes since I opened the bottle. You would have no idea of that evolution in your thirty seconds tasting a mouse’s bladderful. *When I talk about Chateauneuf du Pape Blanc under no circumstances do I include Chateau de Beaucastel Vieilles Vignes de Roussanne. The Perrin brothers are dastardly cheats with this Chateauneuf du Pape Blanc because they use a properly good grape varietal and make it skilfully. **I doubt Mr P’s cellars are good enough for this wine. If you bought this when it was released and put it in the darkest cellar with the most perfectly stable, correct temperature, pressure and humidity, my bet is that it would age and evolve for a very long period of time indeed. What it would evolve into is difficult to discern, but I bet a 2018 (if it were of similar character to this when released) would age majestically for far longer than I will age into decay. Good for you, Badenhorst family!